England’s Ellen Falkner and Rob Paxton are the new Just World Indoor Pairs Champions with the fairytale coming to an end after a tie break for rookie Kiwi bowler Helen Carman and Nicky Brett 1-15, 10-3, 2-0. Brett, who won the title in 2016 with Scotland’s Claire Johnston, continued his scintillating form and aided by Carman, who was making her first visit to these championships, they dropped only one end on the first set. The held a 2-1, three end lead in the second but Falkner and Paxton rolled in a full house, and dominated the set, only dropping one of the remaining five ends and putting the set score out or sight with an end to spare and take the final to a best of three end tie break. After the leads had player, Carman held three shots but with the last bowl from the skips Paxton nabbed the vital shot to take first blood. The second end saw the pendulum swing one way and then the other but Paxton connected with the target and punched the jack to his own waiting bowl that stayed in place until the end. 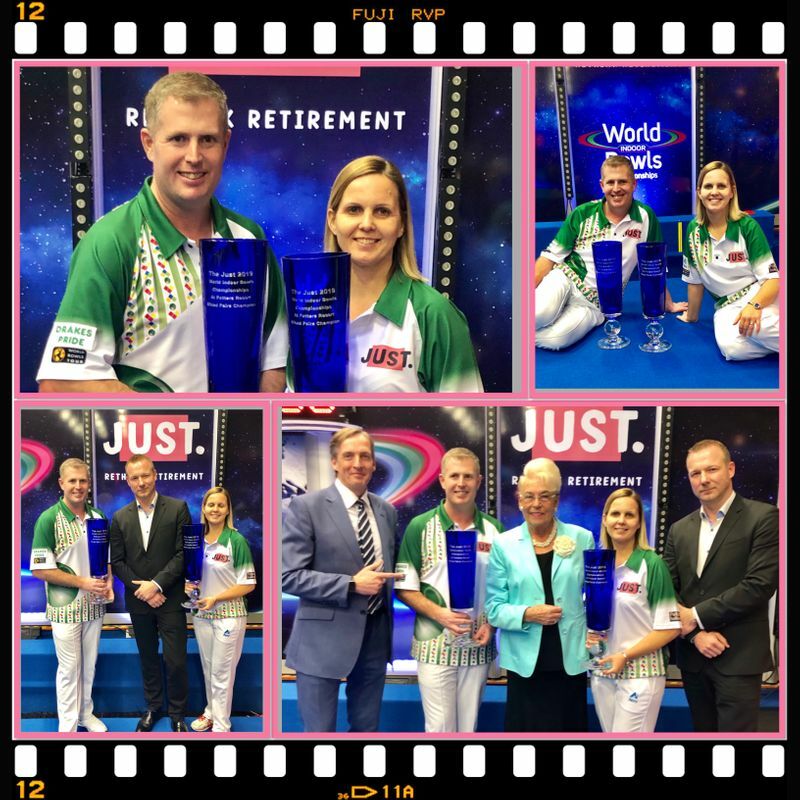 On their way to the title the beaten finalists can boast straight sets victories over Stewart Anderson & Alison Merrien and holders Lesley Doig & Jamie Chestney while Falkner and Paxton beat Julie Forrest & Darren Burnett and then edged a tie break 2-1 against Janice Gower and Paul Foster. That win saw Paxton regain the title he won in 2015 with Marion Purcell from Wales and at her 8th attempt City of Ely player Falkner eventually added her name to the Mixed Pairs Role of Honour, with her best performance in 2011 when she lost in the final with clubmate Greg Harlow to Simon Skelton and Alison Merrien.